Derived no-effect levels for workers (wDNELs) under the European REACH legislation have many aspects in common with occupational exposure limits (OELs). In an attempt to examine under which circumstances wDNELs might be used as exposure guidance outside their intended application, we compared derivation methods, coverage of substances and numerical values of wDNELs against two regulatory OEL lists (European Commission and Sweden) and three sets of recommendations (European SCOEL, German MAK and US ACGIH). Finally, we looked closer at wDNELs where SCOEL concluded that data were insufficient to derive an OEL. Major differences between wDNELs and OELs include regulatory background, intended use, actors involved, substance selection criteria, transparency and procedure of derivation, and operationalisation in terms of risk management measures. As of summer 2018, approximately five times more substances were covered by wDNELs than by the five sets of OELs examined herein. Meanwhile, many occupationally relevant pollutants were not covered by wDNELs, e.g. one-third of Swedish OELs lack corresponding wDNELs. We also note that wDNELs and OELs for the same substance may vary considerably, up to several orders of magnitude. In conclusion, with extensive substance coverage, wDNELs extend the landscape beyond the OELs. That said, important limitations are (1) that many air pollutants relevant for workers’ health are not covered by REACH, and (2) concerns for inconsistencies in the derivation of wDNELs and in their level of protection. In particular, that route-to-route extrapolation is a common practice that may be grossly misleading when the effect of concern is local, e.g. sensitisation. The online version of this article ( https://doi.org/10.1007/s00204-019-02439-0) contains supplementary material, which is available to authorized users. Chemicals in the workplace may be harmful to workers’ health and are consequently subject to various regulatory measures to prevent injury and disease. Within the EU, the so-called Framework Directive (Council 1989) lays out the basic occupational health and safety requirements. Under the Framework Directive, later directives more specifically targeting occupational exposure to chemicals have been adopted. Most significant of these are the Chemical Agents Directive (Council 1998) and the Carcinogens and Mutagens Directive (Council and Parliament 2004). Furthermore, a series of directives establishing lists of occupational exposure limits (OEL) have been adopted. The occupational health and safety directives do not apply directly to the member states’ workplaces, but have been transposed into national legislations. The overall purpose of OELs is to protect workers’ health by stipulating a maximum allowable air-borne concentration of a chemical agent. OELs are a kind of performance standard; how these are to be achieved is not specifically stated, although there is a preference for adherence to a hierarchy of control measures (Council 1998), such as the STOP principle (Substitution, Technical controls, Organisational measures, Personal protective equipment). Moreover, the individual employer is operationally responsible, i.e. by implementation of measures resulting in exposures below the OELs. The EU OELs should be transposed into the applicable legislation of the member states; however, many of the latter already have their own procedures in place for implementation of national OELs. Moreover, OELs are derived by several actors outside EU, and purposes, procedures, and sometimes also available scientific data-bases often differ. These discrepancies have lead to widely disparate values for the same chemical substance (Schenk 2010; Deveau et al. 2015). An additional form of exposure guidance has been introduced through the European Chemicals regulation REACH (Registration, Evaluation, Authorisation and restriction of Chemicals, REACH Regulation 2006). The adoption of REACH was aimed to improve the protection of human health and the environment from potential hazards caused by chemicals. REACH, thus, targets chemicals broadly, including the protection of workers’ health. REACH stipulates that substances imported or manufactured in quantities above one tonne per annum (per manufacturer/importer) shall be registered. Furthermore, if the quantity exceeds ten tonnes, a chemical safety assessment shall be performed to demonstrate safe use of the chemical. The safety assessment includes derivation of so-called derived no-effect levels (DNELs). The DNELs shall be derived for all relevant populations, exposure durations and routes, including workers long-term inhalation exposure. The latter type of DNEL, hereafter called wDNEL, shows many similarities with OELs as both apply to the same population (workers), route (inhalation) and duration (long term). While OELs are a performance standard and their implementation the responsibility of employer, the operational responsibility for adherence to wDNELs lies primarily on the manufacturers and importers of substances. That is, the instructions on safe use of a chemical product specified in (extended) safety data sheets should be developed in such a way that fulfilment of the instructions results in exposures below the wDNEL. In principle, these instructions should be sufficient for adherence to the wDNEL. Thus, there are important differences between wDNELs and OELs concerning the implementation and intended use within their respective regulatory framework (Table 1). Nevertheless, the similar forms (time-weighted averages of air-borne concentrations) and overall purpose (protection of workers’ health) made us wonder how the introduction of wDNELs has affected the broader landscape of OELs. AF assessment factor, OEL occupational exposure limit, OSH occupational health and safety, wDNEL derived no effect level for workers longterm inhalation exposure. The practical impact of wDNELs on the setting or application of OELs is as yet largely uninvestigated. However, various actors and regulatory actions suggest a growing and important role of wDNELs in the control of occupational exposure to chemicals. Deveau et al. (2015) explored a broad range of exposure guidance values applicable to the workplace and constructed a hierarchy with wDNELs placed between traditional OELs and hazard banding approaches. Schenk and Palmen (2013) investigated the motivations and purposes behind the introduction of a dual system of OELs in The Netherlands in 2005, a move that separated “private” OELs, to be derived by industry and intended to cover the majority of occupationally used substances, from “public” OELs (e.g. for chemicals “without owners”), which remained a task for government authorities. According to interviewed Dutch government officials, they had no intentions to equate such private OELs and wDNELs. Yet in practice, occupational hygienists seem to draw parallels between the two. For instance, 21% of occupational hygienists reported in a questionnaire that they applied the European Chemical Agency’s (ECHA) REACH guidance (ECHA 2012) when deriving private OELs (Schenk and Palmen 2013). More importantly, the European Commission has indicated a desire to harmonise OELs and wDNELs. Thus, it requested its two relevant expert committees, the Scientific Expert Group on OELs (SCOEL) and the ECHA Risk Assessment Committee (RAC) to “(a) Develop and provide a joint opinion … on a recommendation for a limit value for worker protection for N-methylpyrrolidone (NMP) related to inhalation exposure and/or; (b) develop and provide an opinion on the recommendation for a limit value for worker protection for NMP related to inhalation exposure highlighting all issues, for which a common view between RAC and SCOEL could not be presented including methodology” (RAC and SCOEL 2016, p. 3). The two committees were further given the task to perform a comparative critical assessment of the DNEL and OEL methodologies with the aim “to improve mutual understanding of the different approaches and to work towards agreed common scientific approaches including through the further development of existing and new concepts as necessary in relation to workers’ exposure to chemicals” (RAC and SCOEL 2017, p. 5). The assessment revealed significant differences in the methodologies, and led the Commission to conclude “[g]iven the common function of such limit values in protecting workers, it is not considered practical or efficient to request both Committees to continue to work on the same chemical substances” (EC 2017a). The Commission furthermore decided to transfer SCOEL’s responsibilities to ECHA RAC (EC 2018; ECHA 2019). While REACH registrants should derive DNELs and wDNELs by themselves, ECHA exerts a direct influence by providing the guidance (ECHA 2012) and RAC has a more indirect influence via publically available derivations for select chemicals under the restriction procedure and in terms of reference values for substances on the authorisation list. Hence, wDNELs have many aspects in common with OELs, and may be expected to complement OELs in certain circumstances. Yet it is unclear which those circumstances should be. As a first step to illuminate this question, the present work targets similarities and differences through a detailed comparison of wDNELs and OELs, the latter exemplified by two sets of legislative OELs: the EU indicative OEL Values (IOELVs) and the Swedish OELs, and three sets of recommendations: the SCOEL recommendations, the German Maximum workplace concentrations (MAK values and) the Threshold Limit Values (TLVs) derived by the ACGIH. We review derivation methods and principles, the coverage of substances and compare the numerical values of the wDNELs and OELs, respectively. As data-poor substances may be an area where additional exposure guidance values are particularly useful, we specifically investigate wDNELs for substances for which SCOEL concluded that the data were insufficient for deriving an OEL. The present study is based on a narrative literature review and comparisons of regulatory and recommended OELs (EC 1991, 2000, 2006, EC 2017b; ACGIH 2017; DFG 2018; SWEA 2018) to wDNELs collected from the ECHA database of registered substances. For counts of available wDNELs, we used the GESTIS compilation of wDNELs (https://www.dguv.de/ifa/gestis/gestis-dnel-liste/index-2.jsp, updated June 2018). If more than one wDNEL was available, joint submissions and high tonnages were preferred over single submissions and low tonnages, respectively. If a registration dossier contained two wDNELs (i.e. one systemic and one local) the lower was chosen, as that one will determine the operational conditions and risk management measures implemented by the registrant and also those communicated down-stream through the safety data sheets. For metals and other substances where OEL setters made a joint assessment for a group of substances, we selected the elementary metal or, if not applicable, one registered substance among the examples listed by the OEL setters. For a number of substances ACGIH recommends exposures to be kept as low as possible, i.e. without any numerical TLV, this applied to two substances with wDNELs; these were excluded from the quantitative comparison of the exposure guidance levels. Data-poor substances were identified by reading the OEL recommendation by SCOEL, available through the website of the European Commission (http://ec.europa.eu/social/main.jsp?catId=148&intPageId=684&langId=en, 2019-03-18). All 192 documents published by SCOEL or its predecessor the Scientific Expert Group were read and searched for statements on data insufficiency regarding the derivation of 8-h time-weighted average (TWA) OELs. For each substance identified as lacking sufficient data, information on the effects of concern and kind of data identified as missing was extracted and tabulated (Supplemental material, Table S2). Background information on wDNELs for selected substances was extracted from ECHA’s database of Registered Chemicals (https://echa.europa.eu/information-on-chemicals/registered-substances). The focus of the present study lies on 8-h TWA OELs. Short-term exposure limits (STELs), ceiling limits (CLs) and acute wDNELs were not considered for two reasons. Firstly, STELs and CLs are generally described in less detail than TWAs in OEL documents. Secondly, comparisons with acute wDNELs are hampered by a large variation in time-frames for both types of short-term/acute values. As previously noted, wDNELs are derived not only by REACH registrants but also by the ECHA risk assessment committee (RAC). However, the by far largest proportion of wDNELs is derived by the registrants, which accordingly will be the focus in the coming sections. The differences between OELs and REACH wDNELs are summarised in Table 1. The selection procedure of substances to be considered differs considerably. Under the REACH Registration, the tonnage manufactured or imported triggers the need for information and chemical safety assessment, disregarding known hazards or data availability. 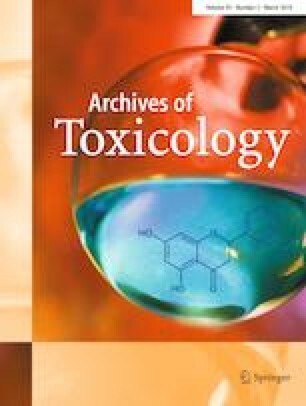 In the work environment arena, on the other hand, a substance’s priority is usually driven by evidence or suspicion of adverse health effects and sometimes also practical factors such as availability of suitable toxicological data. Meanwhile, both wDNELs and OELs are based on an evaluation of the available scientific evidence and should indicate exposure levels that do not cause adverse health effects. The actors and methodologies also differ between the two systems. OEL expert committees generally develop frameworks on how to set OELs. Further, they have systems to address conflicts of interest, to maintain stable work procedures and keep experts for several years. Moreover, most OEL setters have procedures for public consultation before finalising an OEL and the underlying documentation. All these procedures facilitate stability in the assessments. On the other hand, OEL committees generally have no predefined (default) uncertainty or AFs but tend to rely on case-by-case decisions (Dankovic et al. 2015). However, some describe principles guiding the choice of such factors (see, e.g. SCOEL 2018). In contrast, the registrants (manufacturers or importers) that develop wDNELs constitute a disparate group, often dealing with one or a few chemicals only during a limited time period and all with a direct economic interest. To address these potential problems, ECHA offers extensive guidance on the prescribed steps towards a DNEL (ECHA 2012). The guidance includes advice on how to perform extrapolations as well as a set of default assessment factors (AFs) to cover certain aspects of variability and uncertainty, e.g. intra- and interspecies variability, duration of animal toxicity studies and data quality. The defaults should be applied unless deviations can be justified. Some qualitative, but no numerical, guidance is offered on when and how deviations from defaults are appropriate. We have previously shown that the ECHA default AFs are higher than those explicitly or (mostly) implicitly applied by SCOEL (Schenk and Johanson 2010, 2011, 2018). The same goes for other OEL committees. There is no public consultation of wDNELs, nor does ECHA systematically control all the submitted wDNELs, as the REACH regulation only requires ECHA to control at least 5% of all submitted registration dossiers [REACH Regulation 2006, Article 41(5)]. Lack of transparency is an issue for third party scrutiny of DNELs (Westerholm and Schenk 2014; Schenk et al. 2015; Ingre-Khans et al. 2016). The wDNELs and summaries of the data (exceptions for confidentiality are possible) they are based on are only partially publicly available through the registered substances database. The level of detail provided, such as which point of departure that was used, bibliometric references and AFs applied, varies considerably between substances (see also supplemental material). Additionally, a recent study comparing study summaries in 20 registrations with the original studies identified several issues with regards to the accuracy compared to the original (Ingre-Khans 2018). In summary, while there are clear similarities in the overall aim and toxicological principles applied in the hazard assessment resulting in numerical values of the wDNELs and OELs, there are also many differences in their derivation processes. Major differences are the legislative demands, the selection of substances, the actor performing the scientific evaluation and the operationalisation. These differences lead us to expect a larger coverage of substances for wDNELs than OELs, due to the number of substances and their quantities on the European market and the fact that the safety assessment effort is divided over a much larger number of actors than OELs. However, they also give rise to some concern regarding the consistency in level of protection offered, as registrants are a much more diverse set of actors than OEL expert committees. These questions will be further explored in the coming sections. How many substances have wDNELs? Indeed, the number of wDNELs available is several times higher than the 100–800 substances found on national lists of OELs (Ding et al. 2011). Based on the GESTIS DNEL list, some 5200 unique EC numbers, and 3700 CAS numbers, are associated with one or several wDNELs. This can be compared to the 1406 CAS numbers covered by a compilation of OELs from ACGIH and 23 OEL setters across Asia and Europe (Ding et al. 2011). The European subset in this study covered 17 OEL lists and 1305 substances with CAS numbers (Ding et al. 2011). We compared the coverage of four sets of OELs and wDNELs (Fig. 1). Notably, the coverages depend somewhat on how a substance is defined. For convenience, we chose to use the CAS numbers; however, nearly 30% of the wDNELs apply to substances without a CAS number (i.e. EC number only). This contrasts the finding by Ding et al. (2011) that 3–14% of the OELs in the investigated lists lacked a CAS number. Regardless of how a substance is defined, the general picture remains the same. Thus, based on CAS numbers, there are 3.1 times more wDNELs than OELs (the four sets combined) whereas, counting chemical names, there are 5 times more wDNELs. Meanwhile, a substantial portion of the OELs cover substances without a wDNEL, ranging from 21% of the IOELVs to 57% of ACGIH TLVs (Fig. 1). Part of the selection criteria for an OEL is exposure relevance, i.e. for there to be a concern about a substance (and, accordingly, a need for an OEL), there has to be a use that may lead to occupational exposure. Overall, as a substantial part of the OELs do not have a corresponding wDNELs, we can conclude that wDNELs, although covering an unrivalled amount of substances, does not fully cover the range of workplace exposures in need of exposure guidance values. The main reason for lack of a wDNEL is that the substance has not been registered (e.g. 50% of the IOELVs and 57% of the Swedish OELs lack a wDNEL, counting CAS numbers); other reasons are: use as intermediate only, low tonnage, qualitative hazard description only and exposure-based waiving. Substances of concern, regardless of tonnage are identified under the Evaluation, Restriction and Authorisation procedures. These procedures include prioritisation issues such as inclusion on the Candidate list of substances of very high concern. However, it is yet unclear how efficient the procedures are for managing chemical risks in the workplace. To summarise, manyfold more substances have been attributed a wDNEL than an OEL. On the other hand, many substances that are not covered by wDNELs have been given an OEL, and are, thus, highly likely relevant for the work environment. How do wDNEL values compare with OELs? In total, 418 substances have both a wDNEL and at least one OEL from the investigated organisations. 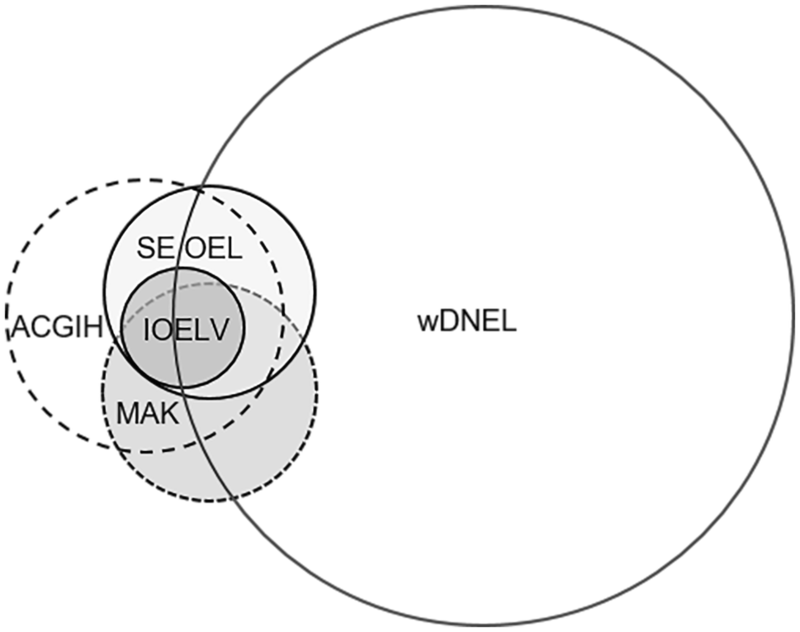 While many wDNEL and OEL values coincide or are very similar, some differ widely (Fig. 2). Among the 418 substances, 27 (6.5%) had a wDNEL that was more than 10 times higher than one or several OELs. About the double, 53 substances (13%) had a wDNEL that was more than 10 times lower than one or several OELs. In the extremes, the ratios span from 0.001 to 35,000, i.e. by seven orders of magnitude. There are, however, some variations between the different OEL setters, as seen in Fig. 2. Prior to the first registration deadline, a substantial similarity was expected between EU IOELVs and wDNELs, as IOELVs were specifically mentioned as an acceptable alternative to derive wDNELs. This was also confirmed after the first (Nies et al. 2013) and second (Tynkkynen et al. 2015) registration deadlines, as the comparisons showed that three-quarters of the wDNELs were equal to the corresponding IOELVs. Tynkkynen et al. (2015) further noted that registrants also tended to adapt SCOEL recommendations not yet implemented as IOELVs. The present study, covering wDNELs after the third registration deadline again shows that, on average, the wDNELs are quite similar to the EU IOELVs and the SCOEL recommendations (upper two clusters in Fig. 2), with 69% and 66%, respectively, of the ratios falling between 0.95 and 1.05. The geometric means of the ratios are 0.75 and 0.84, respectively, meaning that on average, the registrants’ wDNELs are slightly lower than the corresponding OELs. 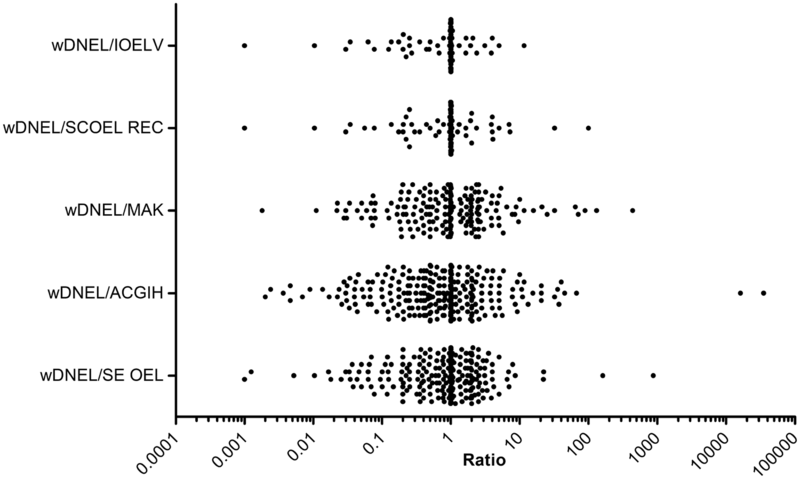 Looking at the extremes, the ratios range from 0.001 to 11.6 (i.e. the wDNELs may be from 1000 times lower to 11.6 times higher than the OELs, a discrepancy in the extremes of four orders of magnitude). Similarly, the wDNEL/SCOEL recommendation ratios range from 0.001 to 100, i.e. by five orders of magnitude. The somewhat higher discrepancy between wDNELs and SCOEL recommendations is due to SCOEL recommendations covering a slightly larger span of substances, not all have been promulgated as IOELVs. In addition, although not influencing the range of ratios, SCOEL has updated or retracted their recommendations for some substances. Before and during the early phases of registrations under REACH, wDNELs were expected to turn out considerably lower than OELs besides the IOELVs, as a result of the default AF approach (Schenk and Johanson 2011; Kreider and Williams 2010). Yet, comparisons after the first and second registration deadlines have shown the two to be rather similar on average, although with a substantial spread (Nies et al. 2013; Schenk et al. 2015; Tynkkynen et al. 2015). Thus, wDNELs collected after the second registration deadline range from 230 times lower to 450 times higher than the Swedish OELs (Schenk et al. 2015) and from 2260 times lower to 7930 times higher than the Finnish OELs (Tynkkynen et al. 2015), by five and seven orders of magnitude, respectively, in the extremes. The lower section of Fig. 1 shows the German MAK values, the ACGIH TLVs and the Swedish mandatory OELs as compared to wDNELs after the third registration deadline. All three sets of ratios show a larger variability than those for the EU IOELVs or SCOEL recommendations. Ratios between wDNEL and OEL were within the range of 0.95–1.05 in 34% of cases for MAK values, 18% of cases for ACGIH TLVs and 27% of cases for Swedish OELs. A comparison of the geometric means of the ratios establishes ACGIH TLVs (0.69) as slightly lower than the MAK (0.92) and Swedish OELs (0.75). The full range of ratios was 0.0018–437.5 for MAK (five orders of magnitude), 0.002–35,000 (seven orders) for ACGIH, and 0.001–875 for Swedish OELs (six orders). Compared to Schenk et al. (2015), the number of substances with both a Swedish OEL and a wDNEL has increased by 28, due to new OELs as well as new registrations. Although the larger number or ratios has also led to a wider span between the extremes, there is also an indication of wDNELs being more aligned between registrants. In 2015, 17 substances with divergent wDNELs from different registrants were found (among substances having Swedish OELs); in the present study, this number was reduced to seven. Lowering of the wDNEL (or OEL) does not necessarily result in a higher level of protection. In other words, a high wDNEL compared to the OEL (or vice versa) does not necessarily mean that the wDNEL is excessively high. For instance, higher exposure guidance may be motivated by new data, improved dose estimates, use of toxicokinetic and toxicodynamic models and/or refined mode of action reasoning. However, if the differences are significant in magnitude, it could indicate an insufficiently protective level. In the present study, we chose to investigate the cases where wDNELs are notably higher than one or several of the investigated OELs. Among the comparisons for the 418 substances in Fig. 2, 11 substances (2.6%) had at least one ratio exceeding a factor of 30 (listed in Table 2). Trimellitic anhydride, phthalic anhydride and maleic anhydride are respiratory sensitisers (e.g. ACGIH 2017), and the high values of the tabulated wDNELs (17.5, 32.2 and 0.4 mg/m3, respectively), in particular for the former two, are likely not protective of this effect. However, for trimellitic anhydride, the local wDNEL refers to “no-threshold effect and/or no dose–response information available” and the endpoint respiratory sensitisation. This may mean that the risk management measures communicated down-stream through the safety data sheet are not designed to meet the systemic wDNEL, but rather the qualitatively defined, and more severe, sensitisation hazard. This emphasises that numerical wDNELs should not be taken out of context of the full chemical safety assessment. The wDNEL for copper metal of 1 mg/m3 is associated with the endpoint description “no hazard identified”. This is in sharp contrast with the SCOEL, who identified respiratory tract effects, including immunosuppression attributable to disturbed alveolar macrophage function as the critical effect (SCOEL 2014). It is further unclear whether the wDNEL applies to respirable, inhalable or total dust, although this would only explain a minor part of the difference in values. The wDNELs for trichloroacetic acid (124.3 mg/m3) and sodium trichloroacetate (141 mg/m3) are both stated to be based on a repeated dose toxicity NOAEL, for local wDNELs it is stated “no-threshold effect and/or no dose–response information available” (no endpoint information given). For neither substance was there any inhalation study reported under repeated dose toxicity; thus, the wDNELs were presumably based on route-to-route extrapolation. Meanwhile, the two MAK values were based on irritation and analogy with phosphoric acid (Hartwig and MAK Commission 2016a). The wDNEL of 0.02 mg/m3 for gallium arsenide was set for local effects; no other information was provided. The ACGIH TLV was based on pulmonary damage, noted amongst other species in rats starting from 0.01 mg/m3, the lowest dose tested in a 2-year inhalation study (documentation dated 2005 in ACGIH 2017). The wDNEL of 0.64 mg/m3 for ziram was derived for systemic effects based on an oral study; however, it can be noted that the DNELfor workers’ short-term exposure and local effects, based on respiratory irritation, was set to the same level as the systemic wDNEL. The MAK value is based on respiratory effects seen in rodents after 28 days of exposure at 0.3 mg/m3, with no effects (NOAEC) at 0.1 mg/m3 (Hartwig and MAK Commission 2016b). The wDNEL for sodium metabisulphite of 225 mg/m3 was derived for systemic effects, while for local effects it was stated “no-threshold effect and/or no dose–response information available”. No other information about the background was provided. The ACGIH TLV was established based on upper respiratory tract irritation by analogy with sodium bisulphite (documentation dated 2001 in ACGIH 2017). The wDNEL for tin metal of 71 mg/m3 was based on a NOAEL from an oral study; no hazards were identified for local effects. The ACGIH TLV is intended to prevent stannosis (documentation dated 2001 in ACGIH 2017). The wDNEL for white mineral oil of 160 mg/m3 (severely refined mineral oil, exemplified by CAS 8042-47-5) was derived for systemic effects, while no hazards were identified for local effects. No other information was provided. For severely refined mineral oils, SCOEL identified accumulation of oil-laden macrophages and the formation of granuloma as critical effects, noted in rats and dogs after long-term exposure to 100 mg/m3 (SCOEL 2011). In summary, for a substantial number of substances, the wDNEL is excessively high compared to the OEL. This is mainly due to an inappropriate assumption of systemic toxicity as the leading effect (and, hence, application of route-to-route extrapolation) in the derivation of the wDNEL. Meanwhile, the OEL documentation shows that local effects such as respiratory sensitization and irritation are critical. Although qualitative hazard conclusions (on, e.g. sensitization) rather than the numerical wDNELs might form the basis for the risk management measures defined in the above cases, excessively high wDNELs values are severely misleading and may give employers and employees a false sense of safety. Do wDNELs offer exposure guidance for data-poor substances? In total, SCOEL deemed data insufficient for deriving an 8-h TWA OEL for 19 substances, or groups of substances (evaluated in 17 documents, Table 3). There are several forms of data insufficiency such as lack of data to identify the effect(s) of concern, lack of data to evaluate the relevance for occupational exposure, lack of data for the inhalation route and lack of adequate dose–response data. For more than half of these cases, the concern was lack of suitable and adequate dose–response data, e.g. data did not cover the relevant exposure range (no NOAEC or LOAEC identifiable), available studies lacked reliable exposure estimates and/or controlled experimental animal data were not available. Furthermore, carcinogenicity data was missing in several cases, in four cases SCOEL voiced concern for carcinogenicity but concluded that available data did not allow determination of human relevance (Table 3). In a few cases (lithium hydride and methyl isocyanate), SCOEL judged the data sufficient to propose a STEL value but not an 8-h TWA. Considering the knowledge gaps summarised in Table 3, we note that some may be addressed by fulfilling the standard information requirements under REACH. The information requirements depend on the annual quantity of the substance that is manufactured or imported into the EU (Annexes VI–X to the REACH Regulation 2006; see also Table 2 in ECHA 2016). In brief (excluding conditions and exceptions), the requirements are: 1 tonne or more—in vitro tests and acute oral toxicity, 10 tonnes or more—acute inhalation and dermal toxicity, subacute repeated dose toxicity and screening for reproductive toxicity, 100 tonnes or more—subacute and subchronic repeated dose toxicity, pre-natal developmental toxicity and an extended one-generation reproductive toxicity study, 1000 tonnes or more—chronic repeated dose toxicity, carcinogenicity and developmental toxicity. If no route is specified in the information requirements, the registrants generally are to test the most appropriate route considering the likely route of human exposure. Annex VIII of the REACH Regulation (2006) specifies that “[t]esting by the inhalation route is appropriate if:—exposure of humans via inhalation is likely taking into account the vapour pressure of the substance and/or the possibility of exposure to aerosols, particles or droplets of an inhalable size”. Hence, for substances exceeding 100 tonnes per annum (per importer or manufacturer), controlled experimental studies could meet a commonly identified data gap, namely the lack of reliable dose–response data. Furthermore, Annex VIII states that “studies shall be proposed by the registrant or may be required by the Agency in accordance with Articles 40 or 41 in case of:/…/—indications of an effect for which the available evidence is inadequate for toxicological and/or risk characterisation. In such cases it may also be more appropriate to perform specific toxicological studies that are designed to investigate these effects”. However, the extent to which REACH data will meet these knowledge gaps in practice is unknown. Additionally, human data are not a part of REACH information requirements, while these are a preferred source of data for OEL derivation (SCOEL 2018). Concerns about the sufficiency of REACH minimal information requirements have been raised previously, in the context of classification of substances in general (Rudén and Hansson 2010) and specifically for classification as a mutagen and/or carcinogen (Woutersen et al. 2018). Turning to the question of how the paucity of data is managed in the derivation of wDNELs under the REACH registration process, an overview of the wDNELs for the fully registered substances is presented in Table 4. Lack of data is apparently an issue not only for OEL setting but also for wDNEL derivation. For metallic platinum and hexachloroplatinic acid (exemplifying the two groups of platinum substances), the registrants even opted for qualitative hazard descriptions rather than a quantitative wDNEL. In addition, there are differences in access to data between the two arenas. For eleven wDNELs, registrants refer to study reports as the decisive data source. Study reports may indeed improve the scientific basis of data-poor substances; however, out of the 19 substances in Table 4, only for two, mixed cresol isomers and methyl iodide, study reports filled the data gaps identified by the SCOEL to some extent. Additionally, in most cases, such study reports are confidential and/or difficult to retrieve for an external examiner. For seven wDNELs, registrants used more recent key studies than did the SCOEL recommendation. Another approach seems to be higher AFs (as compared to general OEL practice), generally in conjunction with the use of route-to-route extrapolation or read across. For eight wDNELs, the provided AF or implicit safety margin (calculated as the inhalation POD divided by the wDNEL) exceeds a value of 20. While this is higher than the AFs generally applied by the SCOEL (the geometric mean is 4.3 for recommendations based on animal data, Schenk and Johanson 2018), they are not high in relation to ECHA’s default factors (ECHA 2012). The combined default factors by ECHA for an animal point of departure start at 12.5 (2.5 for intra species not covering allometric scaling and a factor of 5 for interspecies variation in the worker population) and may range up to 225 (including 6 for extrapolation from subacute to chronic study duration and 3 for LOAEL to NOAEL extrapolation). As previously noted, the default range does not include any numerical guidance on AFs for quality of database. Importantly, these default AFs are not validated for oral to inhalation extrapolation. In summary, wDNELs are available for all substances where the SCOEL judged data insufficient to propose an OEL (Supplemental material, Table S3). The data paucity is met in several ways, e.g. by the use of non-publicly available data (study reports) and acceptance of oral to inhalation extrapolation. As noted in the previous sections, we have concerns about the level of protection offered by some of the wDNELs. We conclude that use of a wDNEL in place of an OEL or other occupational exposure guidance value requires a case-by-case evaluation of the scientific basis and intended exposure conditions. The wDNELs constitute a readily available source of exposure guidance values with extensive substance coverage. As such, the wDNELs extend the landscape beyond the OELs. However, there are some important limitations. First, a considerable number of air pollutants that are relevant to control from a workers’ health perspective are not covered by REACH. Thus, one-third of the entries in the Swedish list of OELs do not have a wDNEL. Second, due to the high number of REACH registrants, there are concerns for inconsistencies in the derivation of wDNELs and, therefore, in their level of protection. Indeed, already in our limited comparison against four sets of OELs, we identified some excessively high wDNELs. It is obviously difficult to estimate the total occurrence of excessive wDNELs for data-poor substances, but we note that route-to-route extrapolation is a common practice that may be grossly misleading when the effect of concern is local, such as sensitisation. Neither wDNELs nor OELs are a stand-alone measure for control of risk, each kind of exposure guidance applies in a frame-work of other requirements regarding identification of risk and risk management measures. Consequently, the distance between wDNELs and OELs should be seen in the light of the different purposes of the two legislations. The wDNEL is not the end-product of the registrants’ chemical safety assessment, but one of the steps in the identification of conditions under which a chemical agent can be used safely, for which it is conceivable that, e.g. qualitative hazard assessments may be used in parallel to wDNELs. An OEL, on the other hand, is the end-product of the expert group’s hazard assessment, in the sense that the expert group will not have a further role in the identification of necessary risk management measures at the workplace. We do, however, see multiple trends pointing towards wDNELs being perceived as being of equal standing as OELs (e.g. Schenk and Palmen 2013; EC 2018). As the responsibilities of SCOEL have been reassigned to RAC (ECHA 2019), the distance between the OEL procedure and wDNEL procedure may be reduced, thereby also reducing the disparities between the future numerical values of wDNELs and OELs. Indeed, the Commission Director-General for DG Employment, Social Affairs and Inclusion did comment that “having one common source for scientific advice under REACH and the health and safety at work directives will ensure coherence and further transparency” (quoted in ECHA 2019). As the first requests for RAC to derive OELs attached the SCOEL methodology (SCOEL 2018), and specified that RAC should follow the SCOEL procedures (EC 2017a), we see a potential both for the OELs to be influenced by the wDNEL methodology (i.e. ECHA 2012) and vice versa. If RAC wDNELs become influenced by SCOEL methodology, the indirect guidance these wDNELs constitute may, in turn, affect the derivation procedure and level of registrants’ wDNELs. The most interesting direction for further research wDNELs currently is for data-poor substances, such as investigating the extent to which route-to-route extrapolation and the AF approach may lead to reliability issues with wDNELs. Route-to-route extrapolation involves issues such as first-pass metabolism and systemic vs local effects which may render extrapolation attempts arbitrary. Therefore, the frequency of route-to-route extrapolation should be thoroughly investigated, in conjunction with an analysis of its applicability for the substances and effects of concern. Such an overview would also assist in guiding revisions of the applicable guidance, which currently gives detailed advice on the modification for absorption differences across routes but little advice regarding conditions under which route-to-route is inappropriate (ECHA 2012). For data-poor substances in the present paper, route-to-route extrapolation in most cases coincided with application of, compared to general practice for OEL setting, larger AFs. While there are several proposed evidence-based AFs in the literature and risk assessment guidance documents, these are for limited aspects of uncertainty where there are data for the different states of knowledge (e.g. chronic and subchronic studies). There is a further need to evaluate how AFs should be applied to extremely poor databases as well as to explore how to apply probabilistic approaches instead. This work should be combined with an effort to outline criteria for minimal data for quantitative health-based exposure guidance values. The lack of data outlined by the SCOEL examples herein seems largely unaddressed by the standard information requirements for Registration under REACH. Additional data requirements may be triggered by other REACH procedures, such as Authorisation; however, these procedures are slower than the registration procedure and, as the REACH regulation has only been in place for a few years, it is too early to systematically investigate the impact of the other procedures on work place risk management. This work was funded by the AFA Insurance Foundation (Project no. 160032). Gunnar Johanson is a member of SCOEL. The authors declare no other conflicts of interest.